Sometimes you just want to pitch one straight up the middle, you know? Of course, now upon inspection, I might have pulled out this gag to sell it a little more. The delivery of this one… it just feels like a “what’s in the news?” late night kind of thing. 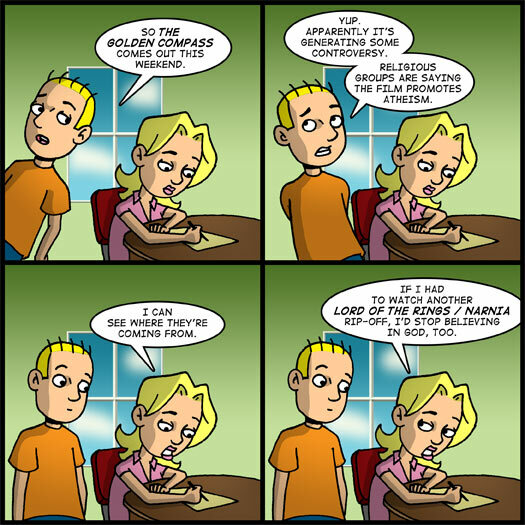 The Golden Compass comes out on Friday and I couldn’t be more bored with the idea. Gordon saw a sneak preview of it last Saturday, so we talked about it a little bit on Monday night’s Triple Feature. I was dead serious when I confessed that I thought The Golden Compass was the sequel to The Chronicles of Narnia. Can you blame me? Winter scenes, witches, talking animals. A little too similar for me, I guess. But what can I say? I’m a dullard. I don’t read “books” – whatever those are. Granted, most fairy tales have bleak and violent conclusions. So it’ s not as though children can’t process the weight of good and evil in a literary allegory. But why does everything have to be politicized to such a degree? I think I have some more thoughts swirling around in my brain on this one, but I might hold off until Friday to set them loose. They might get me in trouble. We’ll see. Until then, thanks for stopping by the site. See you again real soon! So The Golden Compass comes out this weekend. Yup. Apparently it’s generating some controversy. Religious groups are saying the film promotes atheism. If I had to watch another Lord of the Rings / Narnia rip-off, I’d stop believing in God, too.